Project 24 Report | "Northern Crossings"
We sometimes lose track of the fact that Project 24 students who stay at the boarding schools grow older and move onto other schools and hopefully they graduate and prayerfully we hope they go onto college. Because of that reality of growth and movement a program was created called “Beyond 24”. 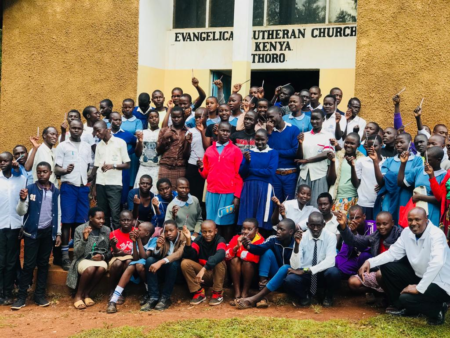 A few weeks ago the students who are in our Beyond 24 program came together at Project 24 Othoro for a three day youth camp led by our site chaplains and evangelists. Since these students stay at secondary boarding schools and not at the Project 24 sites, it is still important for them to remain connected to the program. It is also important that they continually receive spiritual care. This annual event was created to ensure that the students learn more about the Lutheran faith as well as equip them with knowledge so they can discern what is right and what is wrong. A few topics that were discussed at this youth camp included: the life of Jesus, Cults, life skills and intellectuality vs. spirituality. There was also time for the kids to relax, play games and get to know each other better. Overall, it was a wonderful end to the school year. These children will return home to their family clans for the long holiday and then go to their prospective secondary schools in January. On the 8th Commandment – and Turkeys.